Review: Some books are simply meant to be read, but other books are worth talking about. In this 2nd book by the Miller Brothers, Hunter Brown experiences swords, arrows, and the mysterious flame. 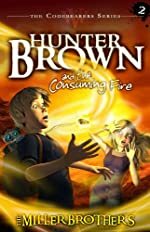 Hunter Brown and the Consuming Fire is a special book for all ages. Intriguing creatures like snarks, fangworms, and the Xin are only part of what is in this book. Hunter Brown, Trista Golden, and Bobby Bungle (Rob) are in high school and discovered a new world called Solandria, which put their lives in jeopardy. After returning from his first trip to Solandria, Hunter Brown waits for a sign from the Author, who is the creator of all things and people. The Author saved Hunter from dying, although Hunter was never really alive in the first place. After Hunter meets Rob, a boy who has been to Solandria before, and Trista, Hunter’s sister’s best friend, then Faith, a Thunderbird, carries all three to Solandria. But when they get to Solandria, they learn that the Resistance is in trouble and only the flame can stop it. Philian, the newest captain, trains the three people to fight better. Trista later shoots a giant fangworm. Everybody tries to rescue Hope, a young girl who Hunter likes. Hope gets captured by the Shadow, which are the evil people and creatures. There is a surprise and shocking ending and you’ll have to read the book to find out for yourself. The Miller Brothers made me want to keep reading on and on until I finished the book. This book kept my interest by having surprises on nearly every page. On a scale of 1 to 20 this book scores a 19 because of all the adventures. (The first book gets a 17.) I hope the third book gets a score of 20. The Hunter Brown series is now one of my favorite sets of books due to all the action inside. When Hunter receives a surprise at the end of the book, I wanted to find out what it was. Unfortunately, I will have to wait until fall to find out what happens to Hunter Brown. Can Hunter really save the Resistance or will it fall to the Shadow? Find out in September in the next installment in the series, For the Way of Truth and Life!!!!! !